8/1 Cup of Coffee: The 2018 trade deadline passed on Tuesday, and while the team did not make any more trades, a few players were promoted in the aftermath of the deals for Ian Kinsler and Nathan Eovaldi. Relievers Matthew Gorst and Travis Lakins were promoted to fill open bullpen spots on the PawSox, with Gorst making his Triple-A debut. Much further down the latter, Antoni Flores made his return to the lineup and his stateside debut in the Gulf Coast League. Outstanding pitching performances from Enmanual De Jesus (pictured, left) in Greenville and the tag team of Thad Ward and Hunter Haworth for Lowell propelled the Drive and Spinners to wins. A three-run fifth inning doomed right-hander Josh A. Smith, who turned in an otherwise solid outing. Smith allowed five hits in six innings, striking out seven. Matthew Gorst, promoted from Portland earlier in the day, followed with his Triple-A debut. The 2016 12th-round pick generated five ground ball outs in his two innings of scoreless relief, giving up a pair of base hits. Adam Lind ripped his 10th homer since joining the PawSox over the right field picnic area, and Sam Travis had a double and a walk. Teddy Stankiewicz was cruising through six shutout innings before Erie reached him for five runs in the seventh. The big blow came on a two-out grand slam that gave the SeaWolves a lead they would not diminish. Danny Mars was 2 for 3 with a double, walk, and a pair of RBI for Portland. Michael Chavis reached base three times, going 1 for 3 with two walks. It was a tough evening for Salem, as the Sox did not record an extra-base hit and could not cobble together a rally. Tyler Hill was 3 for 4 with a stolen base out of the leadoff slot, scoring the only Salem run. Brett Netzer also had a pair of hits, driving in Hill with a first-inning single that gave the Sox a short-lived 1-0 lead. Bobby Dalbec had a tough finish to a monster month, getting hit by a pitch as part of a hitless evening. Despite the tough evening, Dalbec closed out July with a .330/.421/.773 line that included 10 home runs. Enamnual De Jesus turned in a dominant outing in the opener of Tuesday's doubleheader. De Jesus pitched a seven-inning complete game shutout, giving up just three hits and striking out seven without walking a batter. Marino Campana delivered the key hit, a bases-clearing triple in the fourth inning. Kervin Suarez and Ryan Fitzgerald had two hits apiece at the top of the Drive lineup. With Greenville down 4-1 in the second inning of the nightcap, the rains came along, halting the contest for the time being. The two teams will try again to play a doubleheader on Wednesday, beginning with the finish of the suspended contest. A pair of Lowell hurlers combined on a five-hit shutout, halting a six-game losing streak. 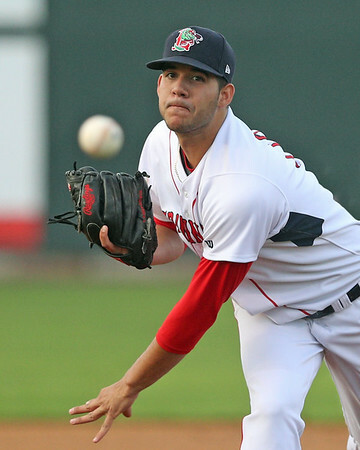 Thad Ward, Boston's fifth-round pick in June, turned in his second straight appearance of four shutout innings. Ward allowed three hits, striking out a pair and walking one. Not to be outdone, Hunter Haworth (pictured, right) went five scoreless frames, giving up only two hits and striking out seven without issuing a free pass. After a rocky start to his season with Greenville, Haworth has righted the ship with Lowell, having allowed only five earned runs in 18 innings in July. A big night at the plate by Devlin Granberg paced the Spinners. Granberg was 4 for 5 with two doubles, a run scored, and two RBI. Jarren Duran blasted a solo home run to extend his hitting streak to 13 games, while Kole Cottam had a double and pair of RBI as part of his two-hit night. An eighth-inning rally off of Yoan Aybar knocked off the GCL Sox. Aybar, a converted outfielder, has been impressive in his shift to the mound but struggled on Tuesday, allowing three runs and walking three in 2/3 of an inning. Brandon Howlett ripped his 10th double of the season and third in his last three games. A pair of players made their first Gulf Coast League appearances. Antoni Flores, who had a .949 with the DSL Red Sox2 before getting hurt in mid-June, made his stateside debut, going 1 for 2 with a triple. 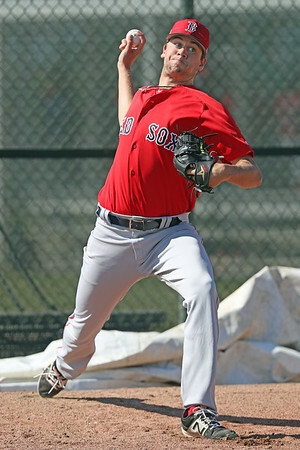 Brandon Perez, Boston's 32nd-round pick out of Miami Beach (FL) High School, made his first pro appearance. Perez was 1 for 4 with a double. The Sox used nine hits and 10 walks to rout the Athletics on Tuesday morning. Leadoff man Gilberto Jimenez had four of those hits, including a triple, to go with two runs scored. Carlos Sanchez also tripled as part of a two-hit morning, and Fabian Andrade worked three walks. Yoelvis Guedez turned in a strong start, giving up just one run on five hits in five innings. It was an all-around tough day for the Red Sox2 squad, as they committed five errors and managed just two hits. All six runs surrendered by starter Jose Ramirez were unearned, as the right-hander lowered his ERA to 3.95. Yulis Hernandez scored the Sox only run and stole a base as part of a 1-for-3 effort. Player of the Day: It's been another solid season for Venezuelan left-hander Enmanuel De Jesus. He turned in his second seven-inning complete game of the season, and the first shutout of his pro career. The seven strikeouts give the 6-foot-3 De Jesus 77 in 79 1/3 South Atlantic League innings, and he continues to pound the strike zone, with 15 walks in that time, and no outings with more than three free passes.